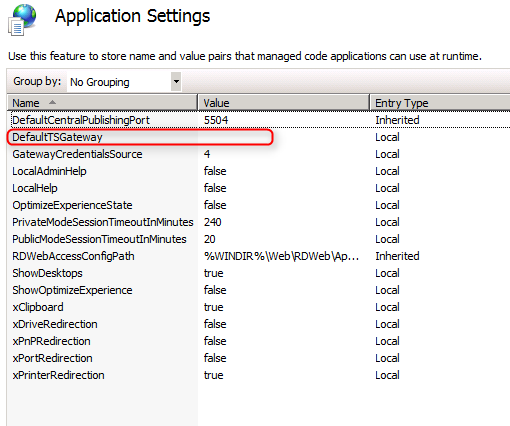 In "RD Web Access", there is no option to enable Remote Desktop Gateway. Therefore, administrator can configure the default Remote Desktop Gateway for users in IIS. Assuming Remote Desktop Gateway and Remote Desktop Web Access were installed in the same server named "rdg.contoso.com"
To configure Remote Desktop Gateway, please read "Deploying Remote Desktop Gateway in workgroup environment" for your reference. 2. Launch "Internet Information Services (IIS) Manager". 3. Expand "RDG > Sites > Default Web Site > RDWeb > Pages". 4. 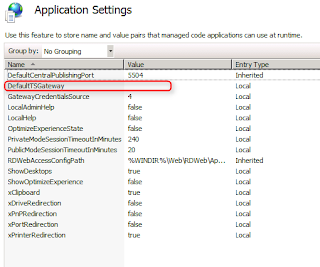 In the detail pane, double-click "Application Settings". By default, there is no Remote Desktop Gateway to be assigned. 6. Under "Value", type "rdg.contoso.com". Now, all Remote Desktop Connection in Remote Desktop Web Access is through the Remote Desktop Gateway, "rdg.contoso.com". Remark: To configure the above settings of Terminal Services Gateway, the IIS path is "<Server Name> > Sites > Default Web Site > TS".